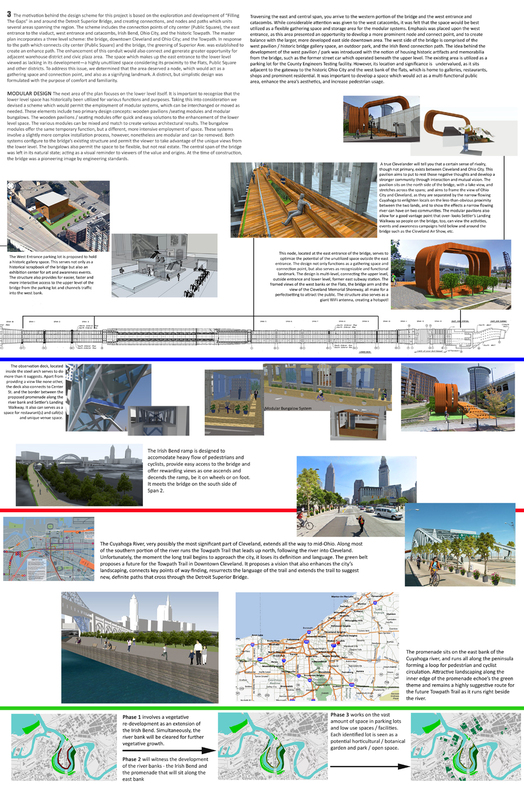 Overview: Using the Detroit Superior as an urban artifact and taking advantage of its centralized location, this project demonstrates the public utilization of the bridge to connect Ohio City and Downtown Cleveland, plus surrounding areas in a dynamic, easy – to – access setting designed for slow moving pedestrian and cyclist traffic. 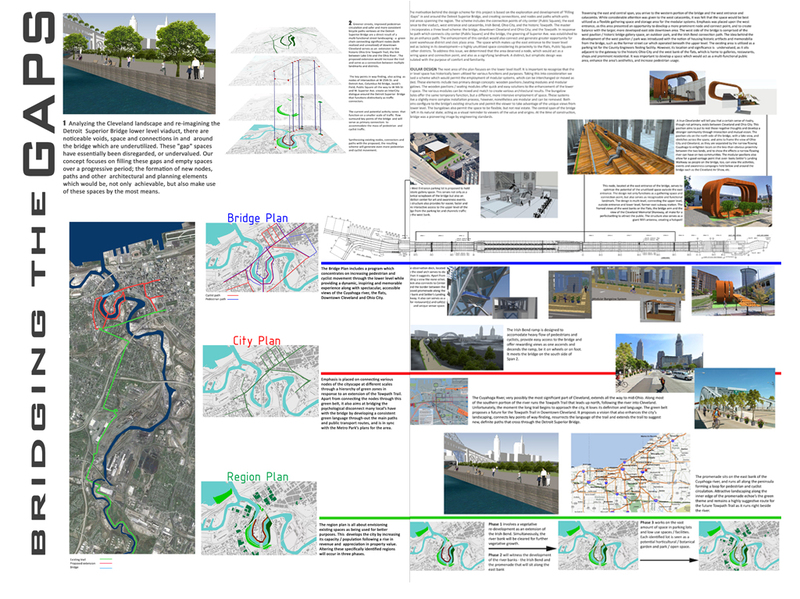 Connections are made at various scales of the city – connecting and developing the nearby river banks, as well as connecting a larger, more significant area through the introduction of a ‘green’ language. Our proposed vision, through various connections, paths and high activity zones, is to attract masses of public from both sides of the river into a dynamic space which, over time, begins to form an organic community of its own – a community that unites two populations. 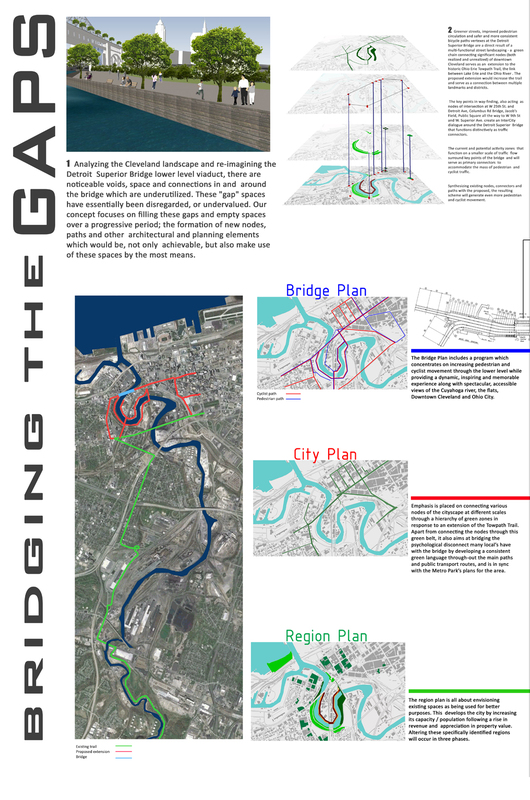 In essence, the bridge, lower and upper level, is designed to serve as an urban catalyst that increases usage of the historic structure, inform users of its prominent history, act as a platform for awareness, recreation, entertainment and exhibitions, pose as an inspiration to the possibilities of change and strengthen the communal bond across the two lands through setting an emotion of mutual belonging.